Introduction: Posterolateral traumatic lumbar hernias are an uncommon problem. These defects may not be recognized initially, or may develop in a delayed fashion. Immediate and delayed repair have been described. We describe two cases of delayed laparoscopic repair of traumatic posterolateral abdominal wall hernias identified at the time of initial injury. Case 1: A 22 year-old male was involved in a MVC resulting in Grade II liver laceration, pulmonary contusions, mandible fracture, and pelvic fractures. There was a palpable right flank bulge and obvious posterolateral disruption on CT. In addition, this patient had a large degloving soft tissue injury over his right flank without evisceration. He underwent operative repair of his mandible and pelvic fractures. Since he was without evisceration or bowel compromise, definitive repair of his posterolateral traumatic lumbar hernia was delayed. The soft tissue defect was allowed to heal by secondary intention. Five months post-injury the wound had healed and he underwent elective laparoscopic repair with PTFE mesh of his posterolateral traumatic lumbar hernia. He was discharged home on post-operative day one. He has returned to full activity and work full time without restrictions at 6 months follow-up. Case 2: A 37 year-old female was involved in MVC resulting in a Grade II liver laceration, a Grade III spleen laceration, and a posterolateral traumatic lumbar hernia. She was nine days postpartum at the time of her MVC. The liver and spleen injuries were managed nonoperatively. She had no clinical or radiographic evidence of evisceration or obstruction, so definititive repair was delayed. Nine months post-injury she underwent successful elective laparoscopic repair of the posterolateral traumatic lumbar hernia using PTFE mesh and was discharged home post-operative day one. She has returned to full activities without issue at 18 months follow-up. Conclusion: Traumatic posterolateral lumbar hernias are an uncommon problem, but are a known consequence of blunt trauma. If urgent laparotomy is required and the tissue integrity is adequate, the defect should be repaired with mesh. However, if indications for urgent laparotomy are absent or the tissue integrity is poor, then expectant management and delayed repair may be the preferred algorithm. 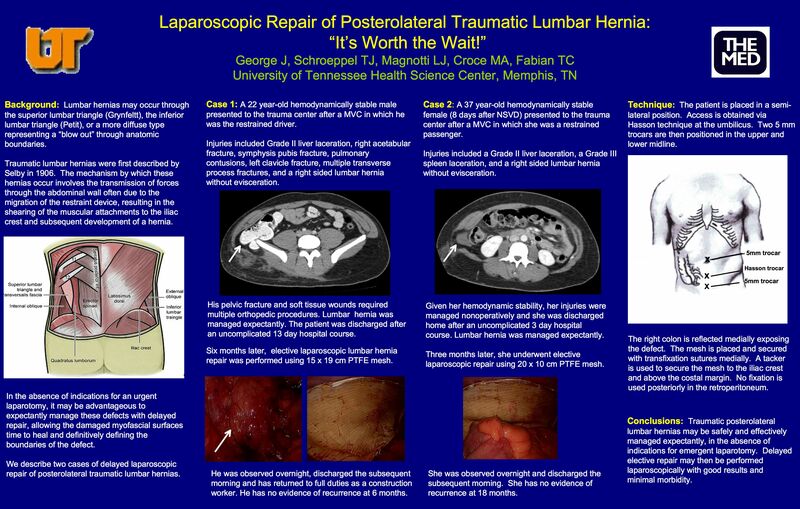 We have described two cases of posterolateral traumatic lumbar hernia resulting from blunt abdominal trauma that were managed expectantly and successfully repaired laparoscopically.